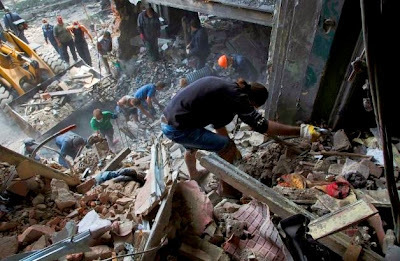 SNIZHNE, Ukraine -- An airstrike in eastern Ukraine sent an apartment building crumpling to the ground Tuesday, killing at least 11 people and adding to the steadily mounting civilian death toll from the fighting between government forces and pro-Russian insurgents. Rescue workers remove debris at a collapsed apartment after an airstrike in Snizhne, 100 kms east from the city of Donetsk, eastern Ukraine on Tuesday, July 15, 2014. Rebels pinned the attack on the Ukrainian air force. The government swiftly denied blame but was not immediately able to offer an alternative explanation. The bombing in the rebel-held town of Snizhne demonstrated how airstrikes and heavy rocket fire are becoming increasingly common as the conflict drags into its fourth month. The attack comes one day after a Ukrainian military transport plane was shot down in disputed circumstances. The devastation in Snizhne bore signs of a strike by several missiles and left only a mountain of smoking debris. The four-story apartment block appeared to have been hit in two separate spots, causing the collapse of several tiers. A nearby house was also destroyed. Resident Igor Chernetsov lost his wife in the attack. "I heard an explosion, and suddenly I was thrown out of the apartment, out of the fourth floor," said Chernetsov, his head swathed in a bandage. "I woke up covered in dust and had no idea what had happened." Health officials in the Donetsk region, which includes Snizhne, provided the number of dead. Rescue workers pulled a small child with broken legs alive from the rubble as grieving residents sifted for belongings. An Associated Press reporter counted six large impact craters. Dmitry Tymchuk, a military analyst who coordinates closely with Ukraine's Defense Ministry, said that since rebels are unlikely to have any planes capable of conducting the bombing, there could only be one explanation. "Only Russian aviation could have performed the airstrike on Snizhne," he wrote on his Facebook account. The Defense Ministry stopped short of that claim but insisted the bombing could not have been carried out by the air force as none of its planes were on sorties at the time of the strike. Security Council spokesman Andrei Lysenko called the incident a "cynical and bloody provocation" aimed at discrediting the armed forces. Sergei, a rebel commander at the scene who declined to give his surname, said locals bore witness to Ukrainian involvement. "Many local citizens saw the plane that dropped the bomb — it had Ukrainian markings," he said. "Why Ukraine would bomb its own territory is harder for me to say." No reliable official recent death toll has been produced, but hundreds of civilians are believed to have been killed so far in the conflict. Authorities said Tuesday that 258 servicemen have been killed in fighting and 922 injured. Representatives for the separatist Luhansk People's Republic said that 12 more civilians were killed Monday evening in the eastern city of Luhansk following rocket attacks and airstrikes. It was not immediately possible to verify those claims. On Monday, Ukraine said one of its military transport planes carrying eight people was shot down by a missile fired from Russian territory. Security Service chief Valentyn Nalyvaichenko said he had "unconditional evidence" that Russia was involved in downing the craft, Interfax-Ukraine news agency reported Tuesday. Rebels said they shot the plane down. Defense Ministry representatives initially suggested all those on the plane had survived and been accounted for. The ministry updated its account to specify that while four on the plane were evacuated, another two were taken captive by rebels and that the whereabouts of two more are unknown. On Tuesday, the Moscow-based LifeNews online television channel broadcast the questioning by rebels of a man identified as a pilot from the downed Antonov-26. LifeNews quoted a rebel militiaman Alexander Gureyev as saying the pilot was allowed to call his family. "Most likely, we will exchange him for one of our militias in captivity. Nobody intended or intends to shoot him. Let his relatives not worry," Gureyev was quoted as saying. Many in the armed insurgency are known to be Russian nationals, but Moscow says they are simply citizens who went to fight in Ukraine on their own. Russia has denied it is helping to fuel the unrest in Ukraine and has in turn accused Kiev-commanded forces of shelling a border town inside Russia, killing one person. Ukraine denies firing shells onto foreign soil. A delegation of international military attaches and reporters visited the site of the shelling Tuesday in Donetsk in what a senior Russian Defense Ministry official termed an "act of good will." Officials showed a residential building damaged by rocket fire and a series of craters next to a border crossing.